This post contains spoilers for "XCV," the latest episode of Samurai Jack. Read our full reviews for the other episodes of Samurai Jack Season 5: "XCII" "XCIII" "XCIV" "XCV" "XCVI" "XCVII" "XCVIII" "XCIX" "C" "CI"
After the last episode's bright, snow-shrouded fight scene, Samurai Jack returned to the darkness with a slower, messier episode. Jack and Ashi both survived the fight with the Daughters of Aku, but quickly ended up inside the belly of a beast -- specifically, a giant monolithic monster hiding underneath the snow. • Jack didn't die in last episode's literal cliffhanger (not that shocking). He and Ashi both survive the fall, and while a trail of blood follows her, she gets the drop on Jack just as his PTSD leads him to hallucinate a murder of crows -- no joke -- calling him a "Murderer!" After a brief scuffle, he and Ashi are swallowed whole by a giant monster. • Jack and Ashi spend the bulk of the episode in the creature's bowels. They fight off monstrous antibodies (using a bit of improvised swordplay with a clawlike limb), endure raining acupuncture-like flechettes sticking into their skin, and wrestle with each other's company. Jack saves Ashi's life several times while trying to convince her that her idol who wants him dead, Aku, is actually the evil one, all the while keeping her chained up and strapped to his back. 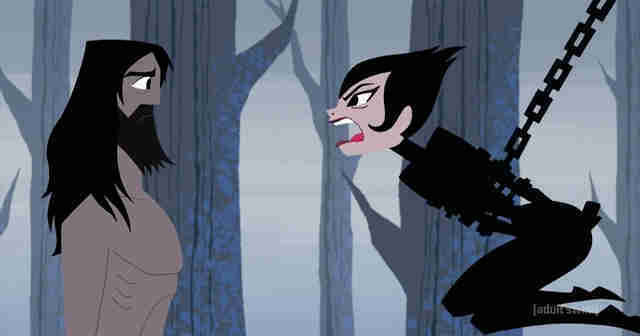 Ashi continues to try to kill him, which gets tiresome -- both for Jack and the rest of us. • Jack has another conversation with himself, who attempts to convince him that he should leave Ashi to die. He refuses to do so, insisting he can show her the true nature of Aku's evil. • Eventually, Ashi and Jack hitch a ride on one of the fish-like antibodies to escape the giant creature through a blowhole and are ejected into the sea. Finding refuge on an island, Ashi attempts to sneak up on Jack using her sickle before she sees a ladybug. She's hit with a flashback to her childhood training, where ladybugs were expressly prohibited and crushed. She then watches Jack -- who hasn't seen her yet -- hold a ladybug and release it into the air. Ashi drops her weapon. The episode ends. If all that sounds like not much happened this week compared to previous episodes in this final run of Samurai Jack episodes -- especially given last week's recovery, rebirth, and quadruple homicide -- it's because... not much happened. Jack and Ashi feel like a much more fun odd couple on paper than they do in-practice, with Ashi yelling at him and undermining his efforts to save both their lives for most of their interaction. Her flashbacks humanize her one-note hatred for Jack, but they don't do enough character work to make what should be a pivotal episode -- where the male and female leads of the season spend the bulk of their interaction chained to each other -- a super engaging watch. Samurai Jack's slow pacing doesn't do the pair any favors when the verbal lashings Ashi flings at Jack grow tiresome. Even Jack responded with an incredulous "Seriously?!" when she attacked him as they were both getting eaten. All this points toward Ashi becoming much more important to Jack's story. The ladybug quite literally protected Jack from having his head cut off by her sickle. Ladybugs fly rampant on the island that blind, stupid luck deposited them onto. We've also seen ladybugs crawling about in earlier episodes this season. Jack's never once had a love interest on the show, but he certainly could. 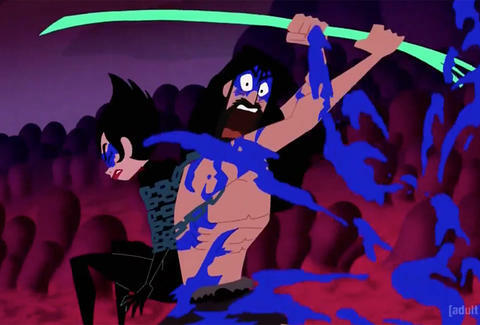 Turning Ashi from sympathetic assassin to romantic possibility would introduce more complications to Jack's de facto immortality and his ultimate goal of defeating Aku in the past before Ashi was ever born. At a minimum it'd at least make sense of their excruciatingly slow burn, but that doesn't mean it wouldn't be weird. For one, Jack's 50-plus years Ashi's senior, and for another, he spent a good chunk of the episode wagging his finger at her while she was chained up in the belly of a sea monster. Ashi's hardly helpless, but the power dynamics at play didn't do the episode any favors. We'll have to wait to see how this plays out. 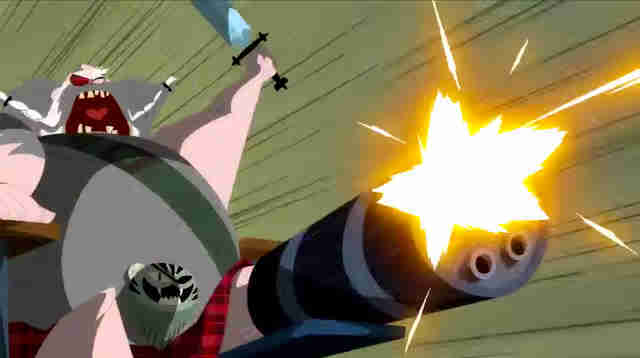 In the meantime, the promo for next week's Samurai Jack treated us to an insane few seconds of classic Jack ally the Scotsman -- still hairy, still angry, and still toting his beautiful machine-gun leg -- so that's reason enough to tune in.